Customs and traditions from ancient history sometimes tell us more about a long-gone civilization than other material evidence. Such social traits serve as a testimony of everyday life, introducing us to the mindset of, let’s say, Ancient Greeks and Romans, whom we owe so much to in terms of science, philosophy, and other endeavors of the human spirit. 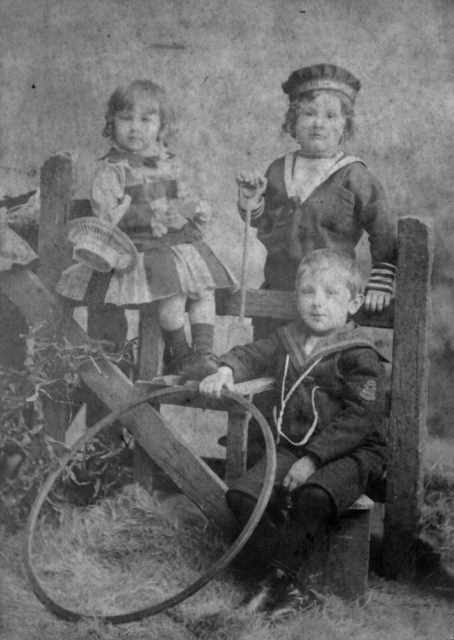 The way children perceived the world during those times remains largely unknown, however, for the focus of historical research is rarely shifted on the lives of the little ones, concentrating on culture, wars, or other political turmoil that decisively shaped the glorious empires of old. Perhaps the best way to introduce ourselves to the life of ancient children is to learn how they spent their leisure time. Well, like kids everywhere and in every given time, they spent their days in simple yet fascinating games. 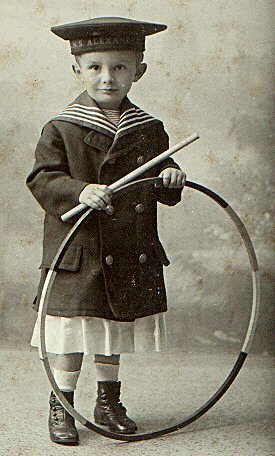 One such game which passed the test of time, becoming one of the oldest forms of child play ever known, is hoop rolling. First recorded in Greece, in the 5th century B.C., this simple game in which a person rolls a hoop along the ground using a stick or other object occurred almost simultaneously, albeit in different variants, in Europe, as well as Asia and Africa. Some believe that a similar game took place in China in the 10th century B.C., but a lack of evidence disputes this claim. In the Tanganyika plateau, the game was a favorite pastime for children for centuries. 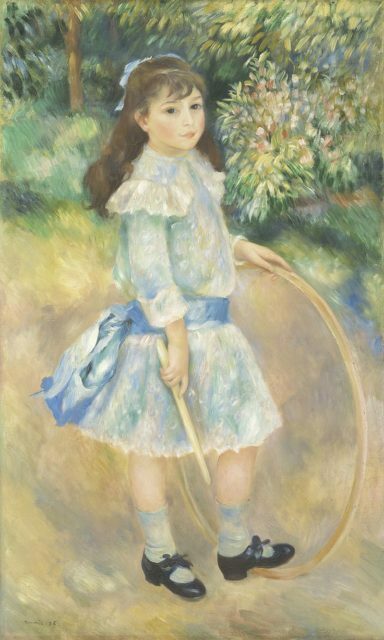 In Ancient Greece, the hoop was called krikoi, while the word used for the stick was elater. It was so popular among the youth that even the “father of medicine” himself, Hippocrates, recommended it as a useful exercise for strengthening weak constitutions. While the game was gaining importance, becoming a sort of a national sport at one point, it also acquired a symbolic potential, thanks to which we are able to reconstruct the significance of hoop rolling during the period. Hoops made of bronze were usually attributed to Dionysus. As the myth goes, the mysterious and omnipotent Greek god used to roll hoops, just like any other toddler, during his infancy. Also Ganymede, a mortal who was, thanks to his exquisite beauty, chosen by Zeus to be his cup-bearer, was depicted as a young man in his teens rolling a hoop. 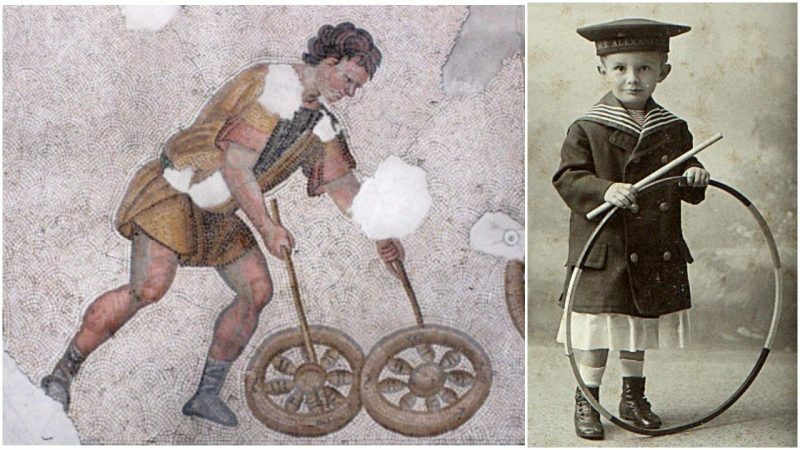 Like many other traits of Greek culture, religion, and custom, hoop rolling was no exception when it came to being incorporated into Roman society. The Romans had great respect for the Greek Hoop, or trochus as they called it, and held it in high regard. They introduced some changes as well. The stick, known as clavis or radius, was shaped like a key and made of metal, with a wooden handle. The design of the hoop advanced as well, for the Greeks used bronze, iron, or copper for making hoops, while the Romans were aware that the wheel must be lighter, but firmly assembled in order to function better. They chose to fit the hoops with metal rings that slid freely along the rim. 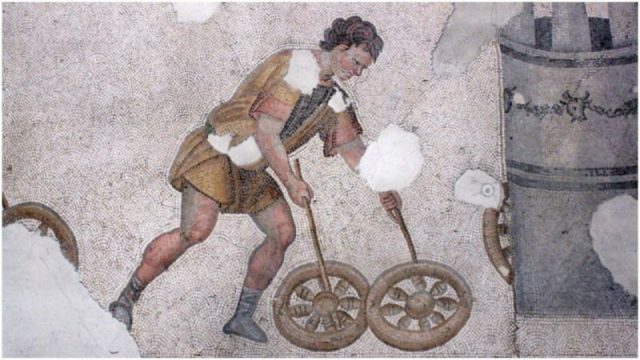 Being a militarized society, the Romans adapted hoop rolling for target practice―they would roll the hoop while throwing a spear or stick through it, enhancing their battle techniques through this form of entertainment. The practice was adopted by the Byzantine Empire, after the fall of the Western Roman Empire, where it gained popularity among children and adults alike. Also, the hoop’s therapeutic use was praised among medical authorities of the Eastern Roman Empire, recommending for the person to jump and run through the hoop. One can imagine the agility needed for such acrobatics. Fast-forward to 15th century England; the game was as popular as ever. Called by a variety of names such as hoop and stick, bowling hoops, or gird, it was considered a must-have among twelve-year-old boys. It was even better if the hoop was attached with pairs of tin squares nailed to the inside of the circle, to produce a jingle-like sound while rolling. 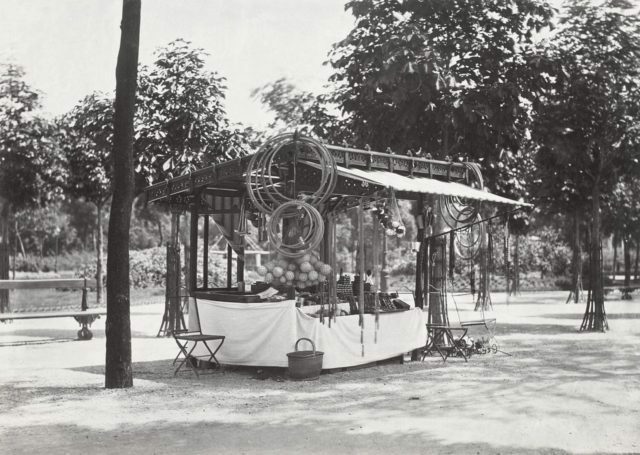 Numerous other add-ons were created for the hoops over the centuries, all for children’s delight. In 19th century London, the streets were swarming with children chasing their hoops and racing each other. The practice was part of obligatory physical education for girls, together with jumping rope and dumbbells. But it soon became a nuisance for the older population, who simply could not comprehend the hype. An initiative was formed around a newspaper called The Hoop Nuisance, intended to prohibit the game in the late 1840s. The reason for this was reckless trundling of hoops, as the practice was called in England, which allegedly caused severe injuries to unwary pedestrians who got caught in the middle of the chase. The police even confiscated a number of hoops in their attempt to stop this “plague” among youths. “Enact, say our modern philosophers, enact. Pass statute by statute. 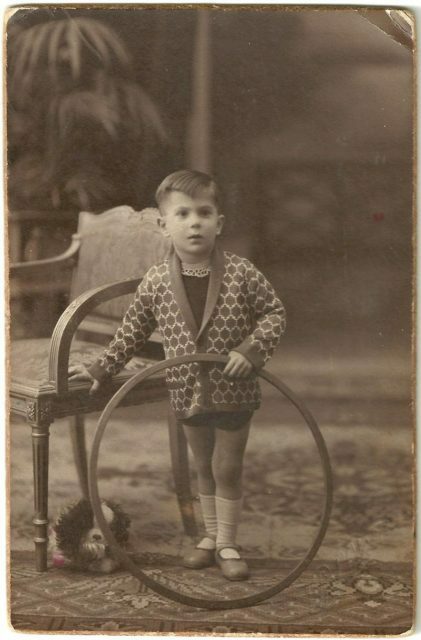 Regulate with exquisite minuteness the cries of the baby in the cradle, the laughter of the hoop-trundling boy, the murmurings of the toothless old man”. Fortunately, no such laws were passed and by the end of the 19th century, hoops were rolling all over the British Empire, and across the globe for that matter. The long history of the game confirms that there indeed are inventions that are timeless. The human ability to entertain himself and others has been present since the beginning of civilization, and, by the likes of it, will be present forever. 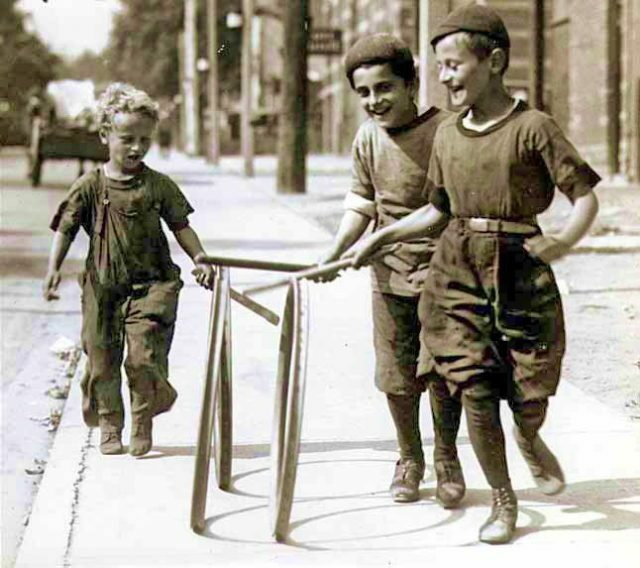 Who knows, maybe we can expect a revival of interest in hoop rolling in the near future? Why not.